In rough order of significance, we start first with the renaissance of Tri-Valley Seafood. What a wild ride! After noting its appearance last October, I made it out there for several good dim sum brunches. Then it abruptly changed owners and cuisines (although it kept the name) and became a pho-centered Vietnamese restaurant. I stopped in at noon on a Sunday in the spring, saw the menu, kept going — I had a jones for dim sum — and ended up at Willow Tree in Dublin. Later I stopped in for a bowl of pho, which was fine but not spectacular, and I meant to return to try the rest of the menu but never did. Now, as of October 18, it has reopened as a Cantonese and dim sum restaurant; it’s not clear if it is the original owners or new ones in charge, but some chatter on Yelp seems to imply that the Vietnamese interlude was always meant to be temporary. (No, I don’t get it, either.) Reviews of the reborn Tri-Valley Seafood are enthusiastic and I’m going to check it out ASAP. Another new place I haven’t tried yet is Amarone, which replaced Silver Palate on Main Street. 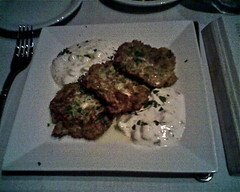 Goodness knows, Pleasanton has no lack of Italian restaurants, but a good one is always welcome. So expect a report. Still no word on the opening of Cafe Main in the former Coffee Beans space at Main and Angela but the former Momiji on the same block has reopened as Main Sushi. Some good news: two recent visits have convinced me that the popularity of Singapore Old Town Cafe in Dublin is definitely justified. On my first trip last September, I was a little underwhelmed, but as several people have pointed out, it’s less than ideal to judge a place on one visit, and even less ideal to judge it on the basis of take-out food. So I went back and ordered a couple of the same dishes and some new ones. Of the repeats, my Chinese doughnut stuffed with shrimp paste was definitely much superior — fried just right, moist, and with a tasty filling; however, the sambal belacan prawns were still just so-so, and underseasoned despite my request to use a healthy ration of sambal. Of the new dishes, though, the Old Town pork ribs were exceptional — marinated and then fried to a crispy finish, with a sweet-savory glaze. Also delicious was the char kway teoh — fried noodles with prawns, Chinese sausage, eggs, and bean sprouts with a dark brown sauce. On my return I had the char kway teoh noodles again, along with an excellent beef rendang (medium beef red curry). Each time the restaurant was nearly full and seemed to be the most popular in the Ulferts Center. One final item: as a reader noted, the Filipino grocery and prepared food shop Pacific Gourmet and Market, which I visited in January, closed a few months ago. The food was tasty and the staff was enthusiastic and friendly, but I fear that sort of place needs a critical mass of an ethnic community to support it on a regular basis, and that just doesn’t exist in Pleasanton. (Plus, the new-ish 99 Ranch Market in Dublin probably had more Filipino groceries, though not the prepared foods. 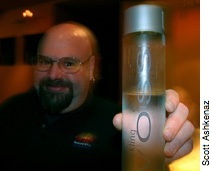 I wish the owners well in whatever their new endeavor might be. The most anxiously-awaited restaurant opening in Pleasanton in the last couple of years, at least for me, was Agora Bistro, which took over the former Bert’s Hofbrau and Steakhouse space at 443 Main Street in late December. I was in Nebraska for Xmas and New Year’s and missed the opening, but made it there as soon as I could. It was well worth the wait. I’d poked my head in a couple of times during remodeling, hoping for a firm opening date, and asking about the menu. I finally got a look inside the other day, and came back for dinner. The high-ceilinged brick front room remains the same, as does the glassed-in “greenhouse” back room (which is one of the nicest places in town to eat at sunset). The new owners have warmed the place up some, and the former bar/hofbrau counter in the front room is now an open kitchen, and the bar has been moved to the back. The menu covers the classics of Greek and Turkish cuisine, with a selection of hot and cold appetizers — including baked prawns as well as the expected spreads like tzatziki, hummus, and baba ghanoush, as well as spanakopita, feta with olives, and dolmades. 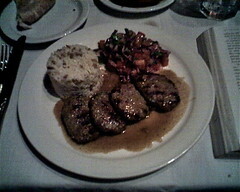 Entrees include souvlaki, moussaka, pastitsia, lamb chops, and beef short ribs. Service was crisp, polite, and efficient. By mid-dinner all 10 tables in the back room where I was seated were full, and the room, which had often seemed cold and dark at night in previous restaurant incarnations because of the expanses of glass, felt warm and inviting, and the people at the next table were conversing with their neighbors. There was a discussion of the difference between Ouzo and Sambuca (alas, Agora at present only has a beer and wine license so the question was moot). As I left I noticed all but two of the 12 tables in the front room were also occupied, and there were several parties waiting at the door. 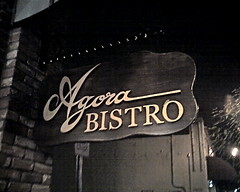 Agora Bistro looks like a big hit and is a very welcome addition to Main Street. The strangest restaurant in Pleasanton, if not the entire Bay Area, is almost certainly Cousin Cafe (6700 Santa Rita Rd.). Driving to and from adjacent Trader Joe’s, I noticed a place called California Burger but didn’t really pay much attention to it, and never made it in for a meal. Some years later the sign said HAWAIIAN BBQ, which I didn’t really pay much attention to either, until I noticed that the California Burger sign was still there as well. OK, you’d think the new owner would want the old signage removed, but whatever. Time passed, and a new sign was added to the previous two: COUSIN CAFE, accompanied by some Chinese characters. Interesting. And this menagerie was soon joined by NOODLE SOUP and BUBBLE TEA. All right… just what was going on here? I paid a visit to the large, almost rambling, glass-walled end unit of the retail strip and found Cousin Cafe, Pleasanton’s only Hong Kong-style cafe that also features Hawaiian barbecue, California burgers, noodle soup, and bubble tea. And pretty much everything else you might want to order. Hong Kong cafe food is a Chinese take on western dishes — you might find baked ham and cheese spaghetti with cream sauce, beef spaghetti with tomato sauce, chicken a la king, beef with fried instant noodle, or even a pork chop over fried rice with an egg on top, covered with brown gravy. But that does not even begin to make a dent in the list of offerings. Eighteen appetizers including deep-fried dace fish balls, chicken wings, roti bread with curry sauce, or onion rings; eight soups ranging from Russian borscht to hot & sour won ton; fourteen variations on meats and seafood, including ox-tongue, all baked over rice or noodles with a cream or “Lisbon” sauce; a couple of dozen rice plates including spam and egg over rice, Hainan chicken rice (a legendary street food favorite in Singapore and Hong Kong), and pork chop with pan-fried onions; seafood, chicken, or fish porridge; eighteen varieties of noodle soup, five of lo mein, four steaks on sizzling platters; and eight kinds of spaghetti and udon bowls. And tucked away in the corner of the menu are a collection of “normal” Chinese-American dishes, including kung pao chicken, Mongolian beef, and walnut prawns. But let’s not forget the legacies of Cousin Cafe’s origins! You may also choose from among a selection of Hawaiian BBQ classics, including kalua pig, loco moco, and spam musubi. And should all of the above fail to excite your appetite, you can always fall back on the orginal California Burger — a beef, turkey, ostrich, or veggie patty, with cheese, bacon, or mushrooms. There’s a selection of festive Asian and western beverages like red bean and lychee drinks, grass jelly, and even Ovaltine. Desserts include ice cream, mud pie, and creme brulee. Decor is strip-mall minimal — it’s a large, dim room with booths and tables and large windows — but service was friendly and quick. And everything is cheap – nothing over $10 except for the steaks, and most main dishes are $6.95 or $7.95 with soup and noodle dishes even less. On my visit I kept to the Hong Kong cafe side of the menu, and had some won ton soup followed by the baked pork chop over fried rice with an egg on top, all covered with brown gravy. 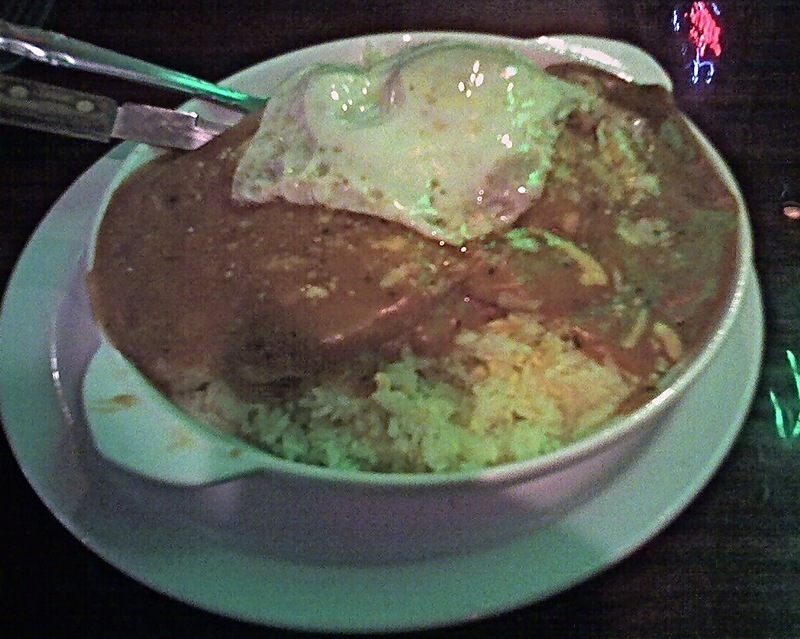 It was an impressive and tasty mound of food (which I didn’t come close to finishing). Needless to say, I don’t know if Cousin Cafe’s kitchen is equally adept at the other 200+ items on the menu, but it will be interesting to see. It’s too bad this place is all the way across town from me, since it’s clearly the kind of place you can eat at often with no premeditation.